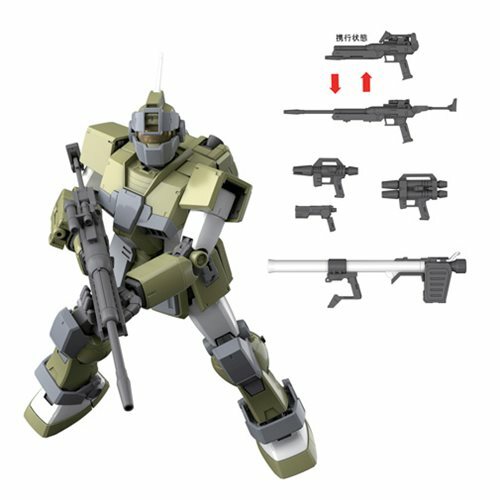 For the first time, the GM Sniper Custom from the Gundam MSV line is released in 1:100 scale! Various action poses - including its iconic sniping pose - can be recreated, and its plethora of weapon parts includes an R-4 Type Beam Rifle, a Dual Barrel Beam Gun, a Hyper Bazooka, a Beam Spray Gun, a Beam Saber, a Folding Hand Gun, and a Shield. There are also 16 runners, a sticker sheet, a dry transfer decal, a marking sticker, and an instruction manual. The Mobile Suit Gundam MSV GM Sniper Custom 1:100 Scale Model Kit stands about 7-inches tall. Ages 15 and up.